Here's Mats Johnson from Sweden with his fly caught 'powerhouse' 25 lbs Spring salmon from the Fernie Haugh Pool of the River Tay's Dalmarnock Beat today. This specimen salmon came to a size 9 Cascade fished on the Monteith Multi System 10/11 with it's 10ft fast tip. For more information on my guiding service Click here. 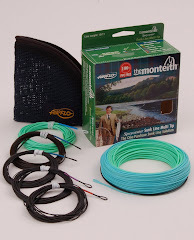 For more information on the Speyline & rod Click here.